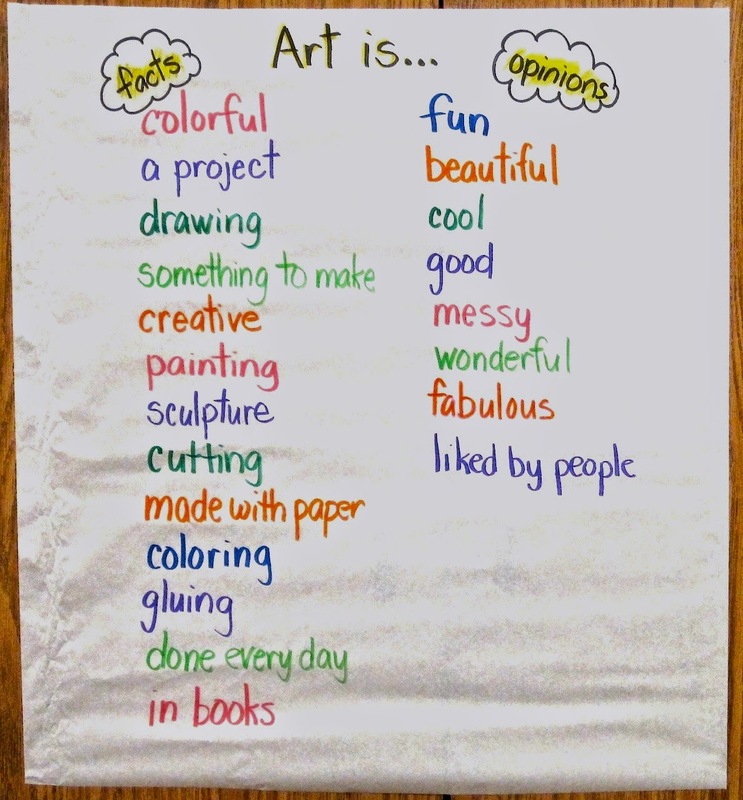 Creating Art With Kids: what is art? I often ask kids the question, "What is Art?" And of course, they are quick with the "drawing" and "painting" but they are also quick with the "beautiful" and "fun" and that always leads me to a confusing explanation in an attempt to define the difference between what art actually is and what people think about art. So the other morning as I was driving through the rolling hills toward the school where I was scheduled to substitute in a friend's second grade classroom, I was going over the three components of my lesson -- talking about what art is, looking at some art work by Wasily Kandinsky, and then having them work with circles. And as I drove along, it suddenly occurred to me that I could incorporate a little "fact vs opinion" into this lesson. Why had I never thought of this before? In the past, whenever I've done this introduction, I've always explained why I could not put the words "beautiful" and "cool" and "awesome" on the chart, because my goal was geared more toward documenting different media, the elements of design, and sometimes who is involved. But this time I used their opinion words, but I sorted as I wrote their responses, with the factual responses in one column and the opinion responses in another column. When the responses were exhausted, I then defined "fact" as something that is true for everyone and "opinion" as what somebody thinks, something that other people might not agree with. I then reviewed each word on the chart, and threw in some examples here and there. This strategy made it a lot easier to talk about opinions later on, as we were looking at their art work at the end of the day. I could ask, then, "Is that your opinion or is that a fact?" and we had a lovely anchor chart for reference. I love how you made this anchor chart also about facts and opinions! Cross-curricular!